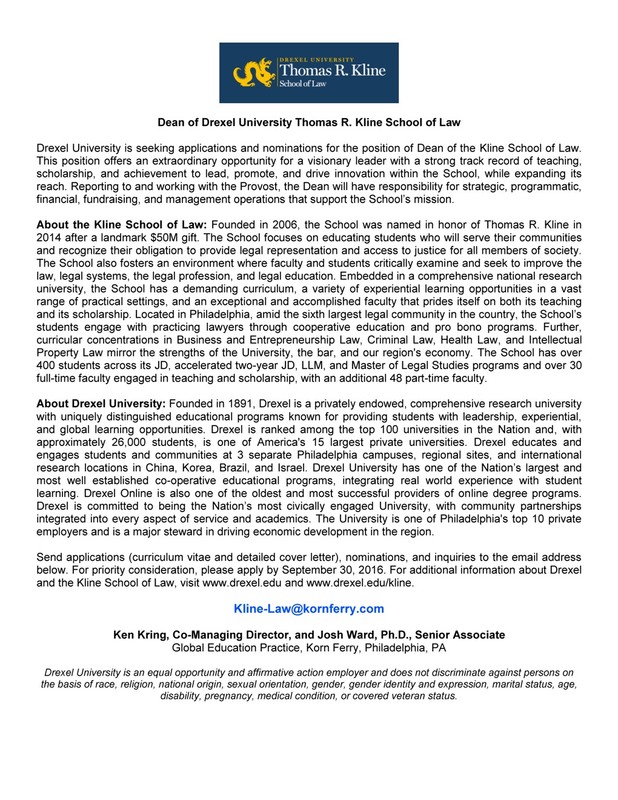 Drexel University is seeking applications and nominations for the position of Dean of the Kline School of Law. This position offers an extraordinary opportunity for a visionary leader with a strong track record of teaching, scholarship, and achievement to lead, promote, and drive innovation within the School, while expanding its reach. Reporting to and working with the Provost, the Dean will have responsibility for strategic, programmatic, financial, fundraising, and management operations that support the School’s mission. About the Kline School of Law: Founded in 2006, the School was named in honor of Thomas R. Kline in 2014 after a landmark $50M gift. The School focuses on educating students who will serve their communities and recognize their obligation to provide legal representation and access to justice for all members of society. The School also fosters an environment where faculty and students critically examine and seek to improve the law, legal systems, the legal profession, and legal education. Embedded in a comprehensive national research university, the School has a demanding curriculum, a variety of experiential learning opportunities in a vast range of practical settings, and an exceptional and accomplished faculty that prides itself on both its teaching and its scholarship. Located in Philadelphia, amid the sixth largest legal community in the country, the School’s students engage with practicing lawyers through cooperative education and pro bono programs. Further, curricular concentrations in Business and Entrepreneurship Law, Criminal Law, Health Law, and Intellectual Property Law mirror the strengths of the University, the bar, and our region’s economy. The School has over 400 students across its JD, accelerated two-year JD, LLM, and Master of Legal Studies programs and over 30 full-time faculty engaged in teaching and scholarship, with an additional 48 part-time faculty. About Drexel University: Founded in 1891, Drexel is a privately endowed, comprehensive research university with uniquely distinguished educational programs known for providing students with leadership, experiential, and global learning opportunities. Drexel is ranked among the top 100 universities in the Nation and, with approximately 26,000 students, is one of America’s 15 largest private universities. Drexel educates and engages students and communities at 3 separate Philadelphia campuses, regional sites, and international research locations in China, Korea, Brazil, and Israel. Drexel University has one of the Nation’s largest and most well established co-operative educational programs, integrating real world experience with student learning. Drexel Online is also one of the oldest and most successful providers of online degree programs. Drexel is committed to being the Nation’s most civically engaged University, with community partnerships integrated into every aspect of service and academics. The University is one of Philadelphia’s top 10 private employers and is a major steward in driving economic development in the region. Send applications (curriculum vitae and detailed cover letter), nominations, and inquiries to the email address below. For priority consideration, please apply by September 30, 2016. For additional information about Drexel and the Kline School of Law, visit www.drexel.edu and www.drexel.edu/kline. Drexel University is an equal opportunity and affirmative action employer and does not discriminate against persons on the basis of race, religion, national origin, sexual orientation, gender, gender identity and expression, marital status, age, disability, pregnancy, medical condition, or covered veteran status.